Swept by a playful mood, Saifon designs an original vase in the shape of a soccer ball. It is carved by hand featuring black details contrasting beautifully with the natural grain of mango wood under a lacquered finish. Also available in white or red. A truly unique gift for soccer coaches and for all soccer lovers! “Sawasdee ka. I’m ‘Nui,’ or Saifon Lertromyanant. 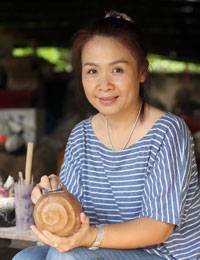 I was born June 5, 1973 in a small rural village where you can find thousands of handmade items such as saa paper, lacquerware, silver and more. My family works in wood carving and furniture.“But they sent me to the city to study, and I met my husband there when I was in school. We married after graduating, and I helped in his family’s business for two years. “After that, I thought I should have a business of my own. At that time, my father was still making wood furniture for a shop in our village. So I thought, ‘why not open my own shop with my father’s designs?’ My father is an excellent carpenter and I inherited this skill from him. Just by looking at a wooden product, I can tell what method was used to craft it. Mango wood requires special treatment. Saifon selects the wood and lets the logs rest under heaps of wood shavings. She removes the bark and slightly roughens the log, then lathes it to the desired shape. This first stage alone can take up to three hours. Then the piece is placed in a kiln and fired for three days. It becomes encrusted with a thick layer of smoke, dirt, and impurities and must be polished several times with sandpaper. When the piece is smooth enough, she carves and decorates it. The final step is painting. Depending on the finishing style and the natural wood hue, a piece can take as long as six days to finish. It is lacquered several times and let dry for two days. It is then polished and finished with a final coat of lacquer. Categories: All Great Gifts For Soccer Fans, All Unique, Home & Entertaining.